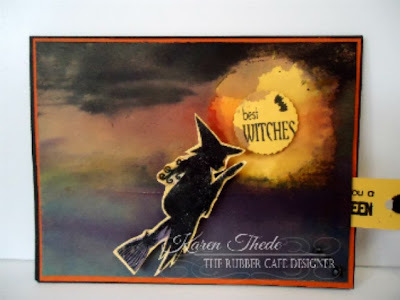 The Rubber Cafe Design Team Blog: Creative Cafe' Kit of the Month Best Witches - Distressed! 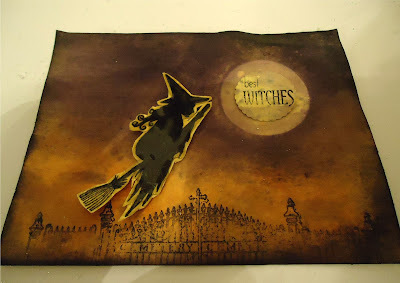 Creative Cafe' Kit of the Month Best Witches - Distressed! Hi Everyone! 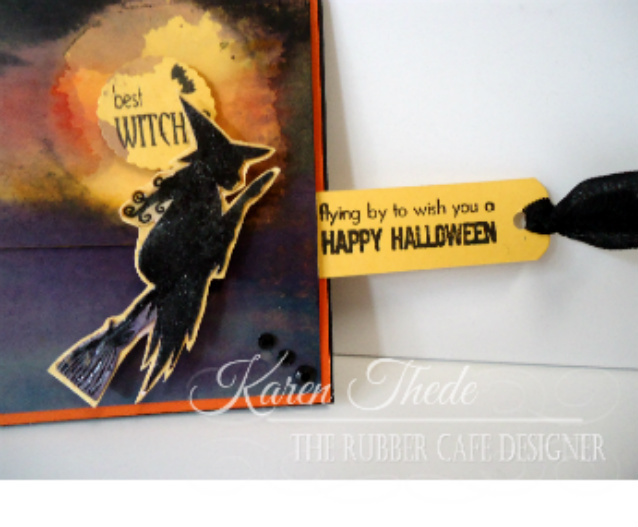 Today I'm back to share with you another card made with the Creative Cafe' Kit of the Month - Best Witches. 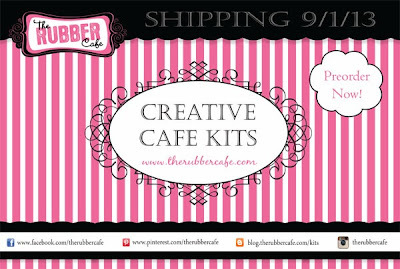 If you're just tuning in for the first time, The Rubber Cafe' just launched our first kit this month from our new Creative Cafe' Kit Club, and the Design team has been busy preparing cards and tags to share with you. Bonus tutorials are available in these posts and will be available to print - so be sure to get in and order your kit today! Today's card is a fun technique using distress inks to create the background of my card. 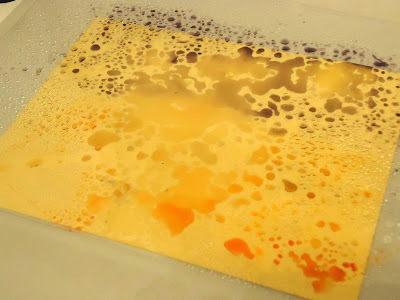 I have done this before but usually use watercolor paper - as it can best handle the water and ink that you are hitting it without breaking down. However I'm using the yellow cardstock from the kit and I chose to do this as it's a nice heavy wt cardstock so really can handle this process. 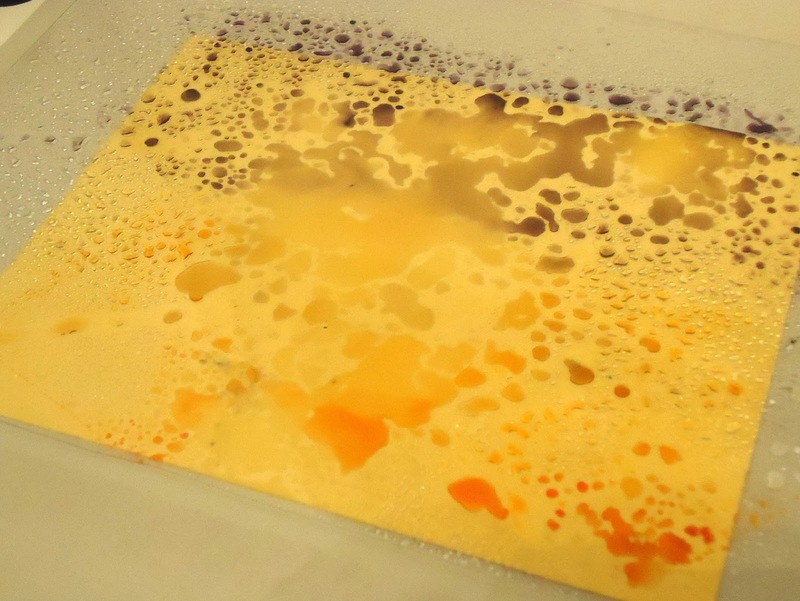 And I love what the yellow coming through did with the ink! Here's my supplies: I started with Dusty Concord; Milled Lavendar and Mustard Seed later I used Black soot and Marmalade for more depth. To apply the ink I'm using a piece of Acetate that is larger than my card base of 4 1/4 x 5 1/2 - this is just from packaging I recycle for just this type of thing. The suction cup hangers I used to create a handles making it easier to lift off my paper. 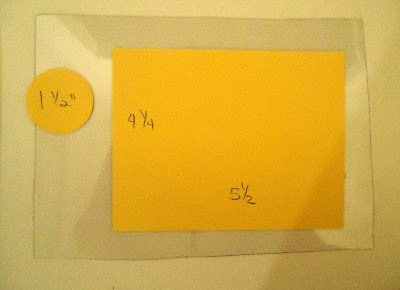 Starting out I cut a basic A2 Base piece of cardstock from the Yellow cardstock in the kit. I also punched a 1 1/2" circle of the same color that I applied as a mask with re-positionable Tom-bo adhesive. This will give me my moon! 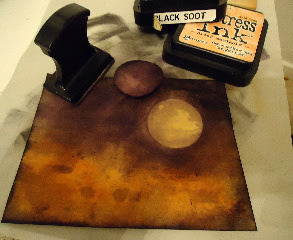 I inked directly to my acetate with Dusty Concord - at the top, Milled Lavendar came next and at the bottom is Mustard Seed. I've also done this with Spiced marmalade in the middle and faded denim in the bottom. Play with it there are no mistakes with this ink! 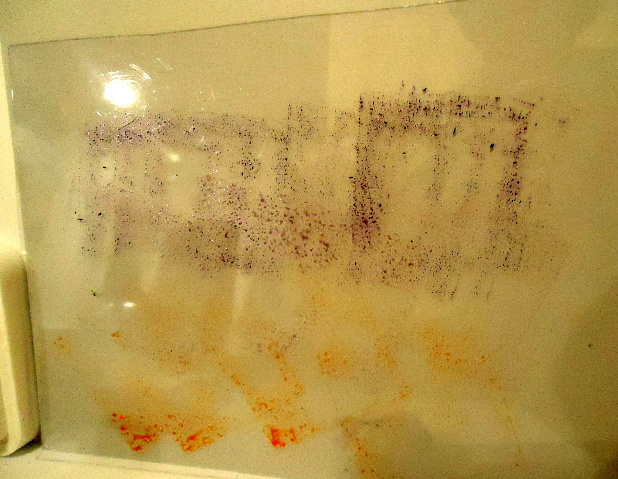 While still on the Acetate, I spritzed it with water. 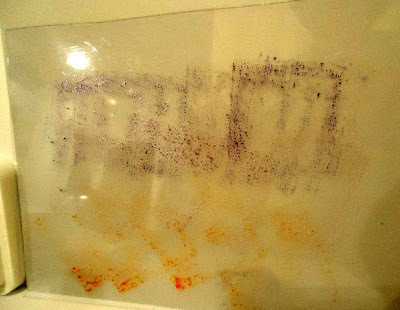 See how it reacts and beeds up from the water! I turned this and placed it so it covered my entire card base where I've already placed my 1 1/4" circle to mask for my moon. 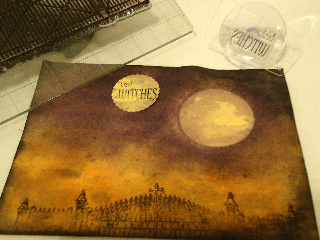 Smooth the acetate to the card stock and see how it pushes the ink around the card base. To make it more interactive you can wet your and prep your cardstock too. 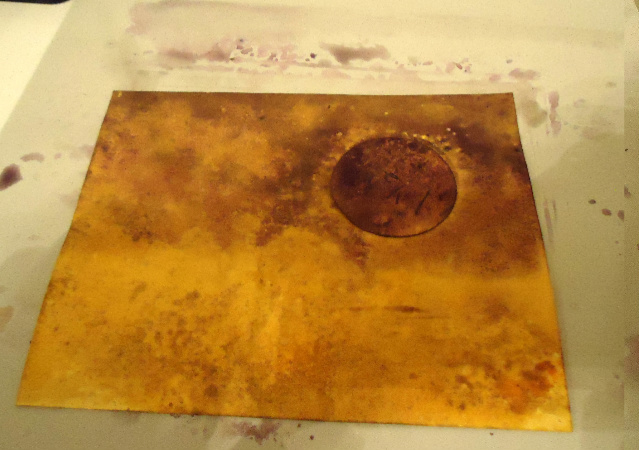 Here it is after lifting off the Acetate. 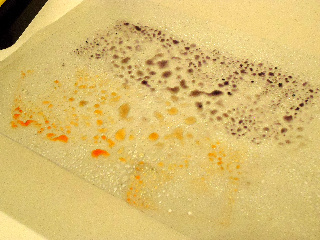 If you want more ink re-apply ink to the acetate spritz and go again! At this point my card base was pretty wet so I pulled out my heat gun and slowly moving it over the base on a low setting I dried my card base. You can air dry but I was too impatient! Here it is dry and I've removed the circle mask. 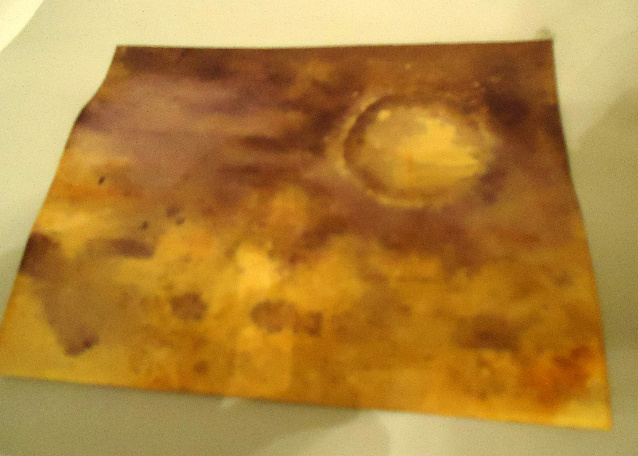 You'll see some of the ink seeped underneath - but that's the affect I was going for. 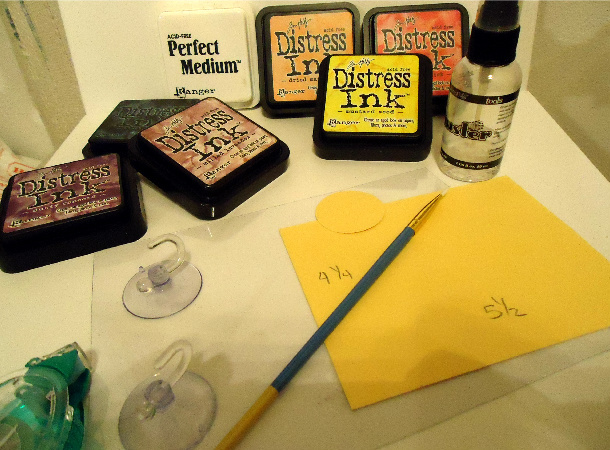 If you want a clean mask with defined edges- using the adhesive mask from Tim Holtz, it will not lift while you're working. Don't throw away your circle mask we'll be using it later for adding dimension to the moon and a place to stamp our 'Best Witches' phrase! Now dry you can add more ink - where you want to for even more depth of color. I added a final edging of Black soot and more Spiced Marmalade to bring out the highlights of the horizon. 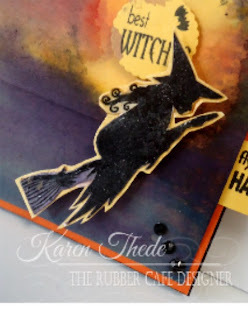 To do this I used our new tool ink blender from Color Box- it allows you to switch out the foam pieces so you can use the same handle for multiple colors. 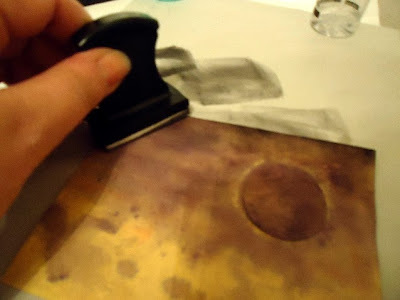 Working first off the card and working towards the edge- tilt the blender tool at a 45 degree angle against the edge of the paper and creating a nice distressed inked edge to your card. 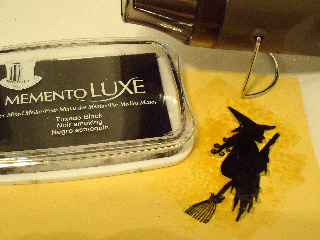 Moving on... for the witch - I stamped it first with the new Memento Lux Black ink- this has amazing coverage and works well with the Clear arcylic stamps as well as rubber. It especially provides great coverage on a solid stamp while still give nice detail on your Sentiments. Not as wet as a pigment ink it's a nice overall ink to add to your supplies. 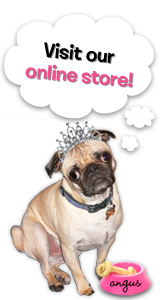 We will be carrying this soon in the store. 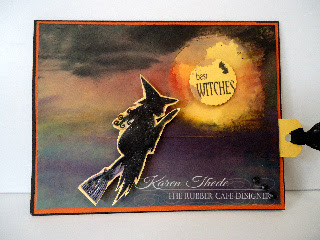 After I stamped it on the yellow cardstock - I embossed it with clear enamel UTEE -and applied 3 layers. before fussy cutting it out for my card. Here's a close-up of her cut out and ready to 'Fly'! Back to my card base - I've finished stamping and punching my 1 1/4" circle with "Best Witches" to be popped with dimensional adhesive on my moon. And along the bottom I decided to add the Cemetary Fence image. 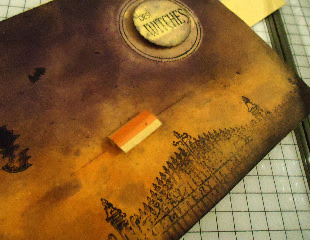 The fence stamp comes from the Add-on Stamp set so I didn't include it in my initial card shown at the top but I really think it adds a lot to the pictorial scene we're creating here so wanted to show it to you now. I also just love the ink that seeped in below across my moon! Really adds the 'spook' factor don't you think? 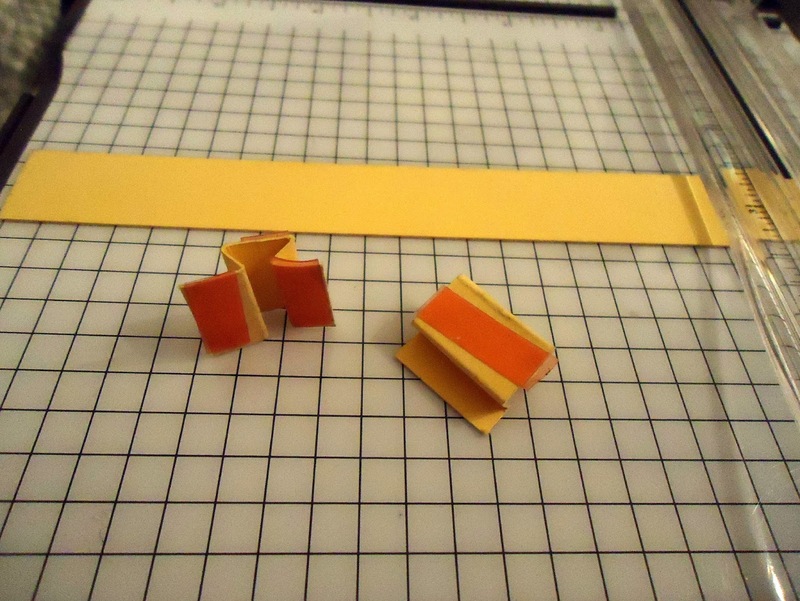 The inner slider mechanism is made using only one of these folded 3/4 x 1 1/2" pieces. I just have two here so you can see where I put my Red line tape. Scored at 1/4' on each end to fold back create a box pleat in the center to fit to the back of the witch. Apply adhesive to each 1/4" flap and a piece on the flat back which is about 3/8" wide. Cut a 1" stripe the width of the card plus and inch. I usually leave it longer as you can always trim it down after . This is where you'll stamp your phrase - "Flying by to Wish you an Happy Halloween". with your trimmer, just cut a horizontal line leaving about 1 1/2"- 2" on each end. Position your folded mechanism so that the flat piece for the witch is sitting on top and the flaps will be flat against the back. DO NOT REMOVE YOUR ADHESIVE. In order for this to move and slide to fly your witch across your card and to reveal your sentiment, you need to make sure NOT to adhere the mechanism to the card base at all. It will ahere to the witch in front and to the stripe in the back. Sandwiching your card front in between. To finish - trim down the card base to 4 " x 5 1/4- and back it- I used the Orange cardstock from the kit cut at 4 1/4" x 5 1/2". Be sure to only put adhesive around the out edges - and leave it open where you stripe comes out so you leave your slider mechanism free to 'Fly'! Add this to a regular A2 card Black card base cut at 5 1/2" x 8 1/2" - scored and folded for a horizontal card. I punched a circle to add black rayon ribbon to the slider message pull. In my card below - I added some black pearls from the kit also. Stamped some of the small bats to the moon and background for an added 'eery' look! Here's another view of my finished card. Hope you'll one of these techniques a try! 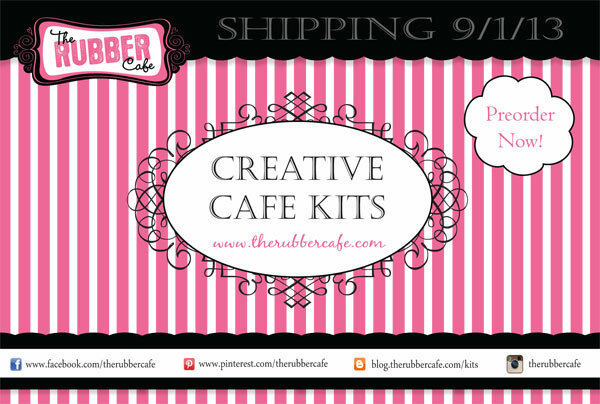 Enjoy- and be sure to get your order in today for you kit if you haven't yet we have a limited number left.